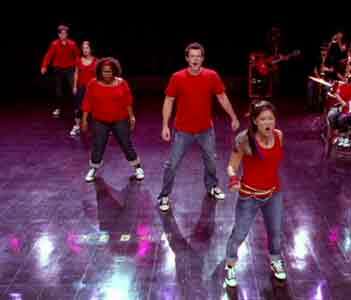 Lea Michele, Cory Monteith, Chris Colfer, Amber Riley, Kevin McHale, Jenna Ushkowitz, Harry Shum, Mark Salling, Dianna Agron, Heather Morris, Naya Rivera, and Darren Criss wear black Converse “Chuck Taylor” All Stars in the show. 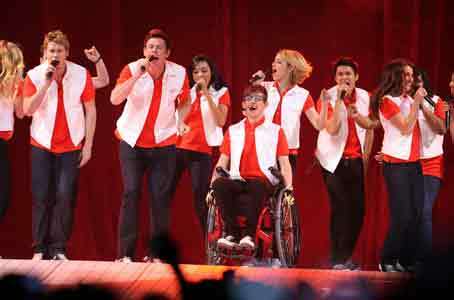 Thoughout this article there are pictures of the Glee Club in performance. Glee is a musical comedy about a group of eager and ambitious students who strive to outshine their singing competition to win Nationals while navigating the cruel halls of McKinley High. Since its debut, Glee has become a bona fide cultural phenomenon, received prestigious honors including the Golden Globe and Peabody Award and singlehandedly made glee clubs cool again. The series boasts critical acclaim, a die-hard fan base among teenagers and adults, two Grammy Award nominations, 2 Platinum and 3 Gold albums, more than 33 million downloads, 2 sold-out concert tours, a blockbuster 3D movie, Four Emmy Awards and three Golden Globes, including the award for Best Television Series - Comedy or Musical. The performers look great in their black high top and low cut chucks. The glee club’s fearless leader is Will Schuester (Matthew Morrison), a talented young teacher whose main objectives are to take the club to Nationals and revive his lackluster love life. New Directions’ aspiring stars include Rachel (Lea Michele), a pitch-perfect singer with an unfaltering determination to be the next Barbra Streisand; Finn (Cory Monteith), the cool quarterback who struggles with popularity and his plans after graduation; Kurt (Chris Colfer), the out-and-proud cherub-faced soprano; Mercedes (Amber Riley), a powerhouse vocalist with an attitude to match; Artie (Kevin McHale), a performer with tons of street cred who isn’t held back by his wheelchair; and Tina (Jenna Ushkowitz), a strong and opinionated goth chick; and the fly dancer Mike (Harry Shum). Artie gets into the performance. There’s also the arrogant and cocky crooner-with-a-soft-side Puck (Mark Salling); ice-cold queen-bee and wannabe prom queen Quinn (Dianna Agron); and the dynamic dimwitted cheerleading duo of Brittany (Heather Morris) and Santana (Naya Rivera). Don’t forget Kurt’s main squeeze, Warbler heartthrob Blaine (Darren Criss). Mr. Schuester’s heart is in the right place and he is determined to help the kids take Nationals, but at every turn he must battle with his nemesis, Sue Sylvester (Jane Lynch), the conniving cheerleading coach who is on a mission to destroy arts programs everywhere. Mr. Schuester’s only ally at McKinley is the OCD-afflicted guidance counselor and love interest Emma Pillsbury (Jayma Mays). In addition to the regular cast, Glee has featured guest appearances by a wide range of talented performers, including Gwyneth Paltrow, Carol Burnett, Kathy Griffin, Cheyenne Jackson, John Stamos, Britney Spears, Kristen Chenoweth, Idina Menzel, Jonathan Groff, Molly Shannon, Olivia Newton-John and Neil Patrick Harris, who won an Emmy for Outstanding Guest Actor in a Comedy Series for his work on the show. 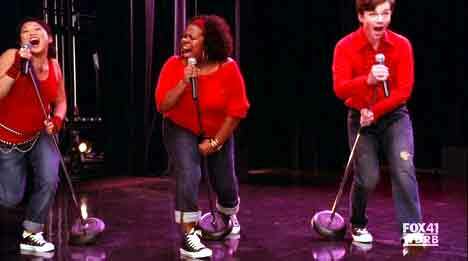 One of the best things about the show is that the glee club performs in black high top and low cut chucks, laced up and occasionally rolled down. Sometimes you also see red chucks. 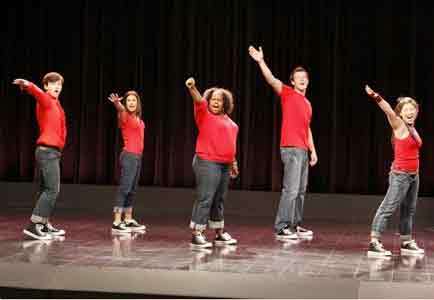 Portions of this article are quoted from the Glee offical website at www.fox.com/glee/.